This GD entry is actually a final version of a test piece done in 2001. On the new version I have basically added more equipment and details as well as gone for a more medival and "witch Hunter"-ish look. In a way the model is an example on how far it is possible to go within the borders of the Golden Demon rules. Being a single model the entry nevertheless displays no less than 3 creatures merged into a single strong W40K image. 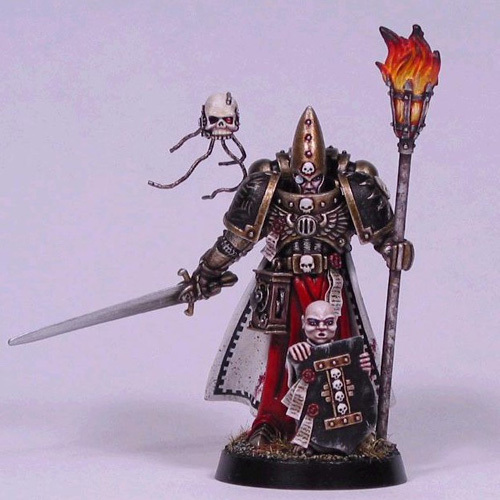 Components for the model include High Elf silver helm head, Empire knights' arms, =I= Eisenhorn's clock device, an old Bretonnia plastic knight's feet, a plastic Space Marine MK8 torso and backpack, a Mordheim witchhunter torch, a plastic skull, and shoulder pads from a techmarine. The rest is greenstuff, wire, and a plastic shield. The painting of the model involved a personally developed technique for painting gold as well as the rather crude weathering technique of simply flicking watered down paint onto the model. The tiny shieldbearer is my first attempt at sculpting a complete model and I am still quite pleased with the "green".